I have been using Windows Live Writer (WLW) to create content for this blog since I started it last year and I love it. Since I started using WLW it has gone through 4 different releases. I have always used the latest version choosing to risk the bugs for the latest features. The latest version was released in early January and you can get all the details on the new features from the WriterZone. I really like WLW because it is configured much like an IDE. With tabs for switching between the WYSIWYG editor, a preview pane and the HTML markup. 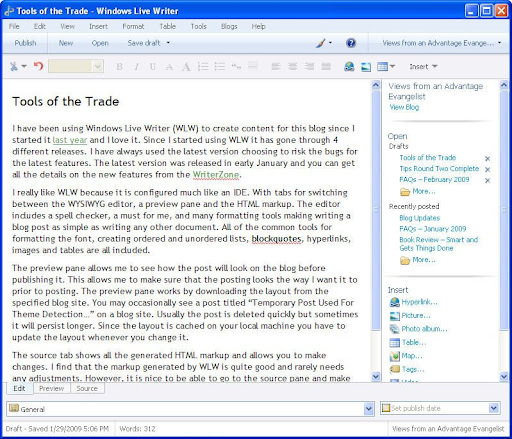 The editor includes a spell checker, a must for me, and many formatting tools making writing a blog post as simple as writing any other document. All of the common tools for formatting the font, creating ordered and unordered lists, blockquotes, hyperlinks, images and tables are all included. The preview pane allows me to see how the post will look on the blog before publishing it. This allows me to make sure that the posting looks the way I want it to prior to posting. The preview pane works by downloading the layout from the specified blog site. You may occasionally see a post titled “Temporary Post Used For Theme Detection…” on a blog site. Usually the post is deleted quickly but sometimes it will persist longer. Since the layout is cached on your local machine you have to update the layout whenever you change it. The source tab shows all the generated HTML markup and allows you to make changes. I find that the markup generated by WLW is quite good and rarely needs any adjustments. However, it is nice to be able to go to the source pane and make those final adjustments to get just the look you want. Another tool I use frequently is Snagit from Techsmith. Snagit is a screen capture tool that has many options for grabbing screen shots. I use the region capture which includes a magnifier so you can easily set your begin and end points and the window capture most often. I have also found using the time delay and include cursor to be very useful. I use many of these screenshots in my blog and other articles. The Snagit editor has many useful features and effects. I use the resize functionality quite often to make my images fit with the article. I also like the edge effects which allow me to capture a region and put a torn edge on it showing that it is only part of the screen. Next to the screen capture functionality my second favorite feature is the batch convert functionality. When Snagit is installed it adds a menu option to the Windows context menu. You can select a group of images in a folder and choose Bulk Convert Images. This brings up an application which allows for many options for converting the images such as; resizing, rotating, captions, borders, edge effects and even color correction. I have used it many times to resize images for posting on blogs or photo sharing sites. What kinds of blogging tools do you use?